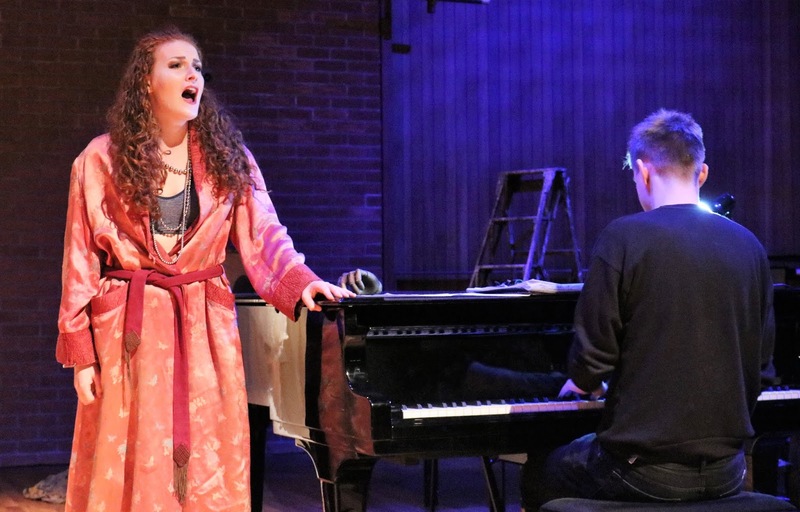 Over 60 minutes, 12 songs from six of Stephen Sondheim’s musicals are threaded together in If You Can Find Me to tell a story of innocence, servitude and love in the costume store of a theatre. 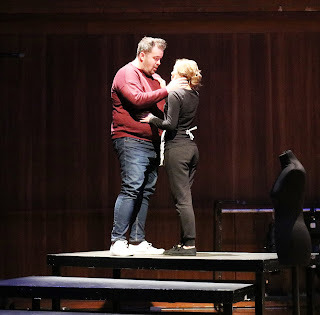 Tenor Ross Scanlon enters the cloistered backstage world as a singing poet who has destroyed his back catalogue and is quickly besotted with a young maid Ella Harkins (Rebecca Murphy). 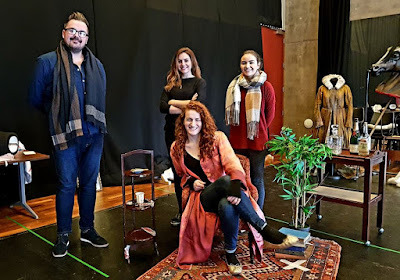 She has grown up behind the curtain, but before her suitor can whisk her out into the real world, he must first unpick her relationship with older servant Wilson (Elaine McDaid), working under the beady eye of the basque and stockinged Mrs Montag (Margaret Bridge). 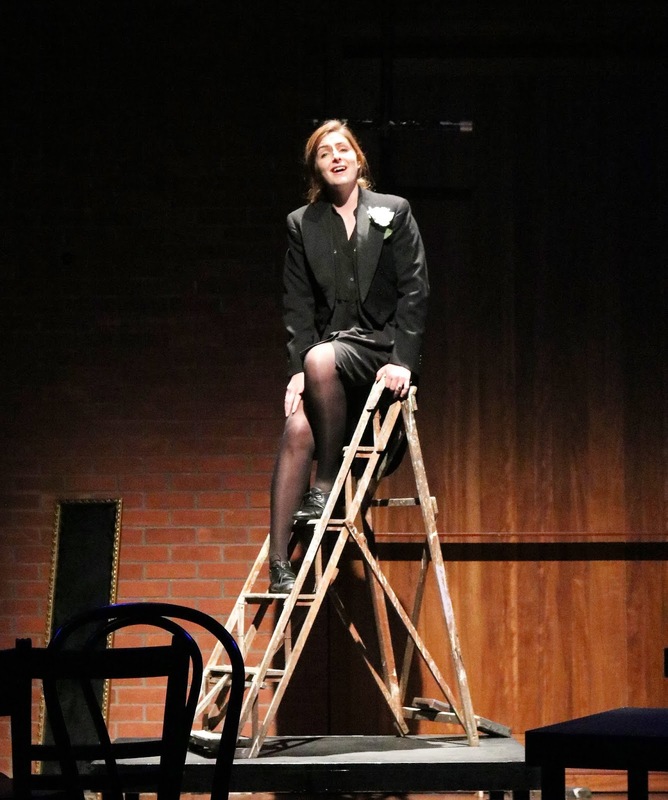 The Sondheim mashup – Evening Primrose, Follies, Company, A Little Night Music, Anyone Can Whistle and Merrily We Roll Along – features less well-known tunes, many from theatre or backstage-themed shows. 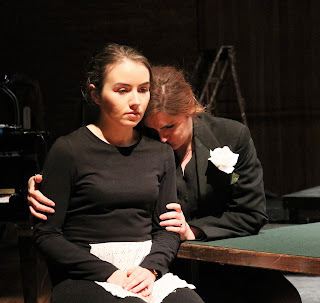 The fun localisation of I’m Still Here found favour with the audience, while the curated playlist and interstitial dialogue by dramaturg Judith Wiemers drew together an intriguing storyline. Murphy excels as the enchanting maid. Her duet with wide-eyed Scanlon, Take Me to the World, finally shows off the considerable dynamic range of her beautiful soprano voice, and out-powers the tenor at key moments, perhaps a hint at the show’s conclusion. The pair’s chemistry is well portrayed. 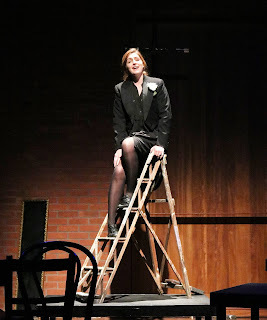 Mezzo-soprano Bridge delivers a sultry performance as the boss, while McDaid owns her ladder-top One More Kiss. Keith McAlister’s fingers rarely cease playing throughout the hour, sustaining the pace and mood. The concept of If You Can Find Me scores highly, but the staging in the venue fails. The titular opening number starts out in the Lyric Theatre bar, though some of the power and gusto is lost when singers move further back under the high atrium. Everyone shifts into the Naughton Studio for the remainder of the performance, but the unraked seating leaves the audience bobbing back and forward like parents at a school performance trying to catch a glimpse of the performers. The majority of the show is played at ground level over the full length of the space, some parts with the cast seated, so unless you sit in the front row, several songs become radio edits and a lot of the direction that Kate Guelke had rehearsed goes unseen. The more constrained stages in the rest of the tour may fix a lot of these problems. While not as strong as Hidden Extras, NI Opera Studio’s continued experimentation with storytelling succeeds in showcasing the young singing talent on the island, and giving a chance for singers to develop their acting skills under a range of directors. 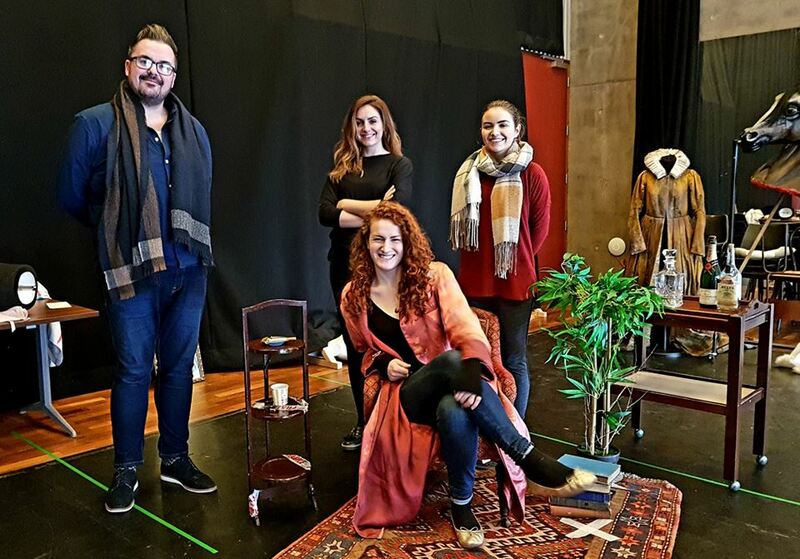 It’s good to see Jessica Hackett from October’s Studio performance among the cast announced for NI Opera’s next Sondheim project, Sweeney Todd, in February. There are further opportunities in January to see If You Can Find Me in The Black Box, Belfast (as part of Out To Lunch Festival at 1pm on Wednesday 16), Newry Chamber Music at Sean Hollywood Arts Centre, Newry (Thursday 17 at 8pm) and Nerve Centre, Derry (Friday 18 at 8pm). Alan, I'm a Stephen Sondheim fan and while I enjoyed the show, and the singing, the shoehorning of songs from other shows felt a bit clunky and forced. To be fair, my husband who doesn't really know Sondheim's music, found it fine but putting songs from Company next to songs from Follies and A Little Night Music....Having said, it was a joy to hear the songs performed so beautifully and for me, the highlight was the singing of Anyone Can Whistle from a show that closed almost as soon as it opened. I wasn’t too familiar with the songs so the shoehorning wasn’t so obvious for me. But glad you enjoyed the singing too. I'm 5'3" and was in the back row and I had absolutely no issue with the seating arrangement. It felt right to be on the same level as the singers for much of the performance. And I loved that it began in the bar. I certainly don't feel Kate's direction was "lost" due to the seats not being tiered. What a silly comment. I’m sad that I wont get the chance to see the show.